MOOSIC, PA (February 1, 2018) - With Opening Day fast approaching, the Scranton/Wilkes-Barre RailRiders have announced their 2019 promotional schedule. The RailRiders, Triple-A affiliate of the New York Yankees, will celebrate 30 years of professional baseball in Northeast Pennsylvania during the upcoming season and the promotional highlights will revolve around that history. The 30th Anniversary Season will include 12 fireworks shows, premium giveaway items and appearances, a jersey retirement ceremony and reunion weekend, the introduction of the Copa de la Diversion initiative, new and returning theme nights and several new season-long nightly promos. This is all in addition to the nine bobblehead giveaways already announced that feature the likenesses of the All-Time SWB Team as nominated and voted on by the fans. "We are primed for a big season," stated Josh Olerud, the RailRiders Team President and General Manager. "This anniversary season celebration is the basis for our promotional slate and the response has already been impressive. There is such a great heritage of baseball in NEPA. We are excited to pay tribute to our past while also hopefully watching our team make the playoffs and witness history in the making." Scranton/Wilkes-Barre opens the season on April 4 in Buffalo before playing the Bisons in the home opener at PNC Field on April 11. 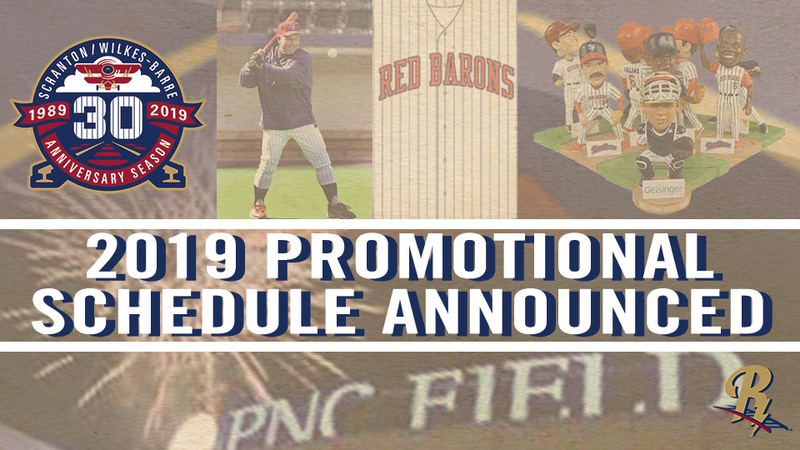 Fans in attendance will receive 2019 magnetic schedules courtesy of Highmark and the final out will be followed by the first fireworks extravaganza of the season. The club will once again play at home on July 4 with post-game fireworks presented by the Pennsylvania Lottery. Additional fireworks nights include June 7 and 21, July 5 courtesy of Shur Save, July 6 and 19, August 2, 9, 10, 30 and 31. The fireworks shows on June 21, July 6 and August 10 are presented by Maines Food and Party Warehouse. The first of two S.T.E.M. School Day Games is set for May 9 at 10:35 A.M versus Indianapolis, featuring a pre-game trebuchet baseball launching competition and interactive activity stations on the concourse throughout the game. On May 10, the first 2,500 fans will receive a 30th Anniversary Season commemorative blanket presented by PNC Bank. On May 11, Jimmy Rollins will be the first honoree from the All-Time SWB Team, as determined by nominations and voting conducted last fall. The first 2,500 fans will receive the Rollins bobblehead. The second S.T.E.M School Day Game is May 23 at 10:35 A.M. against Pawtucket. The Red Barons Reunion Weekend is slated for May 31 through June 2. Scranton/Wilkes-Barre will don Red Barons throwbacks all weekend to pay homage to the first 18 years at Lackawanna County Stadium. On May 31, former manager Marc Bombard will be in attendance as his jersey number gets retired. Former players will be on hand throughout the weekend to both honor Bombard and reunite with the fans. The Chase Utley bobblehead will be given away on June 1. Brett Gardner's All-Time SWB Team bobblehead is presented by Steve Pronko Jewelers and will be given away to the first 2,500 fans on June 8, which is also Backyard Baseball Night when the RailRiders swap identities and play as the Melonheads once again. On Sunday, June 9, Scranton/Wilkes-Barre will play its first of six games as part of the Copa de la Diversión initiative; a Minor League Baseball program designed to engage the local Hispanic/Latino fan base. A new identity with a corresponding logo and uniforms will be announced on March 18. The team is pleased to partner with La Tolteca for Copa de la Diversión. Dickson City Hyundai is proud to present the Luis Severino bobblehead giveaway on June 22 as part of the second Copa game of the season. Additional Copa dates are July 16, 21, August 4 and 31. Each will have its own unique theme to help create a positive, cultural atmosphere around the game of baseball. Like the professional baseball team in Northeast Pennsylvania, the movie Field of Dreams is celebrating 30 years in 2019. On July 5, Scranton/Wilkes-Barre will wear jerseys inspired by the movie and Dwier Brown, the actor who portrayed John Kinsella will make an appearance. It is also Stand Up To Cancer Night as the RailRiders raise funds for cancer research. In July, former Red Barons infielder Rick Schu will be honored with a bobblehead on July 6, courtesy of Maines. Christmas Vacation Night is scheduled for July 18 with a custom RailRiders ornament giveaway. Pat Burrell's bobblehead giveaway follows on July 19. What type of person enjoys a t-shirt giveaway? Most every person, of course. Now take a pause and picture yourself on a harmonious stroll around the expansive concourse of PNC Field in a patriotic, yet custom cotton t-shirt- sizes small, large and extra large. On Saturday, July 20, you can do just that as we double down on the Bosco with Seinfeld Night and Military Appreciation Night. J. Peterman himself, John O'Hurley will make an appearance and the first 2,500 fans will receive a military-themed t-shirt issued by MetLife. Ryan Howard's All-Time SWB Team bobblehead giveaway is scheduled for August 3. If you can dodge a wrench, you can dodge a ball, but you definitely won't want to miss Dodgeball Night on August 8 presented by Planet Fitness. The good news is that any average Joe can get a ticket and have a chance to bid on a custom jersey. The Aaron Judge bobblehead will be given away on August 10 and is brought to you by Casey Dental while UGI's 8-1-1 game is on Sunday, August 11. On Friday, August 30, a 30th Anniversary Season commemorative beer stein will be given out to the first 2,500 fans and on August 31, the final piece of the All-Time SWB Team bobblehead series will be given away. The Gary Sanchez bobblehead is presented by Geisinger. Additional theme nights include Faith and Family Night on April 27, Knoebels Night on May 22, Boy Scout Night on May 31 with a campout, Vs. Cancer Night on June 20 as part of the Yankees Hope Week, Youth Camp Games on July 17 and 30 at 12:05 P.M. and Girl Scout Night with a campout on August 3. As the season approaches, more theme nights and special appearances will be added to the schedule. The RailRiders nightly promotions will have a blend of new ideas along with old favorites. Sunday will get Social in 2019 with special offers via the club's social media platforms. The 1:05 P.M. games are once again devoted to kids and families. The RailRiders are also offering a military discount to their 11 Sunday games this season. Any active or retired service member can show their I.D. to receive $2.00 off any walk-up tickets purchased. Monday's will take a valuable turn this season with Family Buck Nights. During all Monday evening games this season, fans can get $1.00 lawn seats and will have a variety of $1.00 concession items around PNC Field available for two hours after gates open. $2 Tuesdays are back with $2.00 Landsharks and a select $2.00 concession item each week. With nine Wednesday night games this year, Pay-It-Forward Wednesday should help raise considerable funds with a portion of walk-up tickets going to local charities. In addition, each mid-week evening game is a Waggin' Wednesday. Bring your canine friends for a Bark in the Park every Wednesday night (weather permitting of course). Tickets for our four-legged guests are just $1.00, which gets donated to a featured animal shelter of the night. Thirsty Thursday returns with $1.00 specials for two hours after gates open. Glow-in-the-Park Fridays are back as well with the custom blackout and neon green tops. Saturdays are once again supreme with the top giveaways of the season. Gates open one hour before first pitch Sunday through Friday and 90 minutes prior to Saturday games. RailRiders season ticket holders will get access to the park 15 minutes prior to gates opening each day. In April, May and June Monday through Friday games begin at 6:35 P.M. with the exception of Opening Day, which is a 7:05 P.M. start. Saturday games will be played at 4:05 P.M. between April 13 and June 8. Starting on June 18, weekday games will begin at 7:05 P.M. and Saturday contests start at 6:35 P.M. All Sunday games are scheduled for 1:05 P.M. during the 2019 season. All promotions, promotional dates and game times remain subject to change. 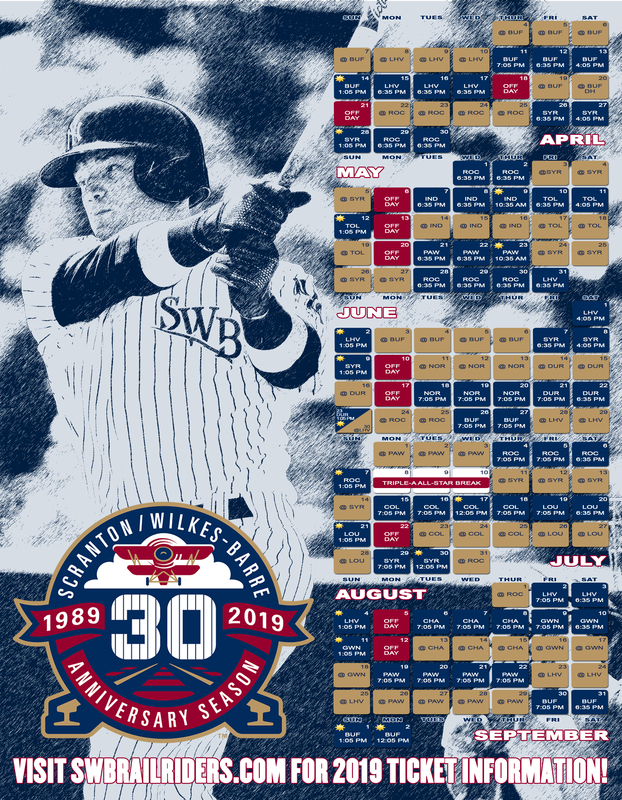 For more information on the complete 2019 Scranton/Wilkes-Barre promotional schedule or to purchase season tickets and mini-plans, please call (570) 969-2255 or visit swbrailriders.com.